We are well aware of the problems associated with stroke and hemiplegia, both for those who are afflicted and their entire families, and that’s why we have been helping families perform the best possible post-stroke rehabilitation since 2003. We are even used to assisting particularly critical patients and those who have suffered strokes several years in the past, because in the beginning one generally follows a standard rehabilitation pathway at hospitals and clinics, but when you start to realize that the results are not quite what you might have expected, and you begin to struggle with hypertonia, it’s normal to begin searching and gathering information, and you find out that post-stroke rehabilitation is not all about stretching, mobilization, robotics, or walking, and that it is also necessary to involve the cerebral functions in the recovery exercises, precisely because the stroke has damaged the brain itself. We also know that you most likely had this insight before reading our articles and seeing our videos, because it’s the first reasonable thing to think about. 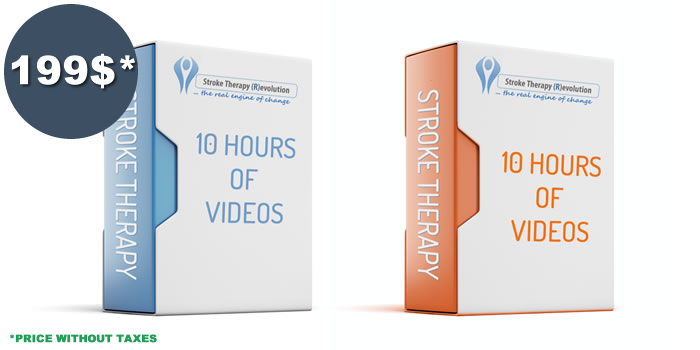 The video guide is structured so that all the exercises illustrated can be adapted to each individual case, because while it was being made we continuously thought about both our most serious patients, who are still lying motionless in bed, as well as our simpler patients, who have already recovered all of the movements, and only need to refine them. The videos of the exercises will also be accompanied by numerous videos that will help you understand what to do, what to avoid, and why certain exercises are beneficial, while others can be harmful. Throughout our years of assisting families and patients, we have learned that it is important for direct contact to be made with our specialists soon after the Video Guide is purchased. That’s why we decided to include an on-line visit with Dr. Valerio Sarmati, the creator of the video guide and the developer of neurocognitive telerehabilitation, directly within the price of the Video Guide itself. During this visit, Dr. Sarmati will have the opportunity to find out about the specific problems of your case, and will immediately indicate the most suitable and effective exercises for initiating your pathway to recovery. 1. If one of your children under 11 years of age has suffered a stroke, brain injury, or infantile cerebral paralysis, the work described in the video guide must be further adapted. 2. No movement disorders have been encountered following a stroke, cerebral haemorrhage, brain tumour, or head injury, but only cognitive disorders. 3. In these cases, the stroke has affected the Cerebellum or the Pons, and we are quite familiar with the problems associated with these types of injuries, but the video guide that we have created is for all other types of brain injuries. If you have an injury of this type, we recommend that you schedule a visit with Dr. Sarmati beforehand, so that he can indicate the exercises most suitable for your case. Stroke recovery takes time, energy and perseverance. In fact, we’re talking about at least one hour of work every day for several months. Entrusting this work to a physiotherapist or a clinic implies a major financial undertaking, and a considerable savings can be obtained by performing the rehabilitation work at home. One hour of physical therapy can have an average cost of $60 to $150, which means that the family could find itself facing a financial burden of $1800 – $4500 each month. We also know that the family member who read our pages immediately feel that they will not be capable of assuming responsibility for their family member’s rehabilitation, as they see it as a highly specialized discipline that should only be entrusted to authorized individuals. It is absolutely true that post-stroke rehabilitation is an extremely refined discipline, but not in the sense that one might think… in the sense that the physiotherapist’s talent in the field of post-stroke care does not depend on their manual skills, but rather their ability to choose the right exercises and to best stimulate the patient from both a cognitive and perceptual standpoint. We’re not talking about a manual skill. 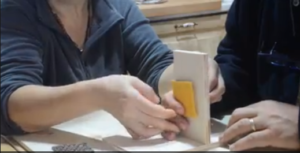 In order to see a demonstration of what we’re talking about, take a look at this video, which shows a family member helping their loved one do the home rehabilitation exercises that they learned from the video guide. We often use videos like this during our courses for professionals who want to learn neurocognitive rehabilitation, or for clinics who want to offer telerehabilitation. And when we point out that the man doing the exercises is not a professional, but is rather the patient’s husband, everyone remains speechless. By this we hope to make you understand that you will gradually be able to perform the exercises in a manner that’s perfectly suitable for your loved one’s recovery needs. You’ll be redirected to a PayPal page where you can confirm your purchase with either your PayPal account or a credit card, after which you will immediately receive an email confirmation containing a link to our video course. You will be contacted by our staff within 24 hours to schedule your online visit with Dr. Valerio Sarmati. One possible worry that you might have in undertaking this new journey of recovery is that of being left on your own, and not receiving any further assistance. While the video guide allows the buyer to independently manage their work at home, by following the step-by-step explanations contained within the videos themselves, we have also created a continuous support system in order to allow your work to be constantly monitored, if you so desire. Immediately after purchasing the video guide, you will be placed in direct contact with its creator, Dr. Valerio Sarmati, who will provide you with your first guidance on how to make the most of the home rehabilitation process, offering specific indications based on the characteristics that he sees in the patient during the course of the online meeting itself. In order to monitor the quality of your work at home, we have created a Facebook group, which can only be accessed by the patients and their family members. This is our “virtual clinic”, where users can post videos of the exercises they are performing at home, and our specialists can provide them with the necessary corrections and suggestions in real time. The continuous support offered by the group is currently free. Once you have completed your first free online visit, we will nevertheless remain at your complete disposal in order to provide online support for organizing your work program. The “support program” that we created especially for the video guide’s users has had an extremely positive impact on the quality of recovery in recent years: this program consists of a package of 2 monthly visits, with any additional support you may require being provided via the Facebook support group. Here’s a small example of how the assistance takes place within the support group. The Video Guide for post-stroke recovery was created in Italy in 2010 thanks to the research conducted by Dr. Valerio Sarmati. Dr. Sarmati is currently engaged as a professor of Neurotraumatological Rehabilitation at the Sapienza University of Rome, and is an expert on neurocognitive rehabilitation (the Perfetti Method), which was named in honour of Dr. Carlo Perfetti, the Italian neurologist who pioneered this fascinating and highly-effective rehabilitation method for hemiplegic patients, with whom Sarmati himself studied rehabilitation at the beginning of his career. From 2010 up until today, hundreds of families have downloaded the video guides, and they are currently distributed in English, Spanish, German and Italian. Stimulating movement, perception, speech and cognitive processes, the telerehabilitation model devised by Dr. Sarmati is the world’s first and only telerehabilitation method designed for the home recovery of post-stroke hemiplegic patients. Prior to purchasing the video guide, many people ask us whether it is still worth while to do rehabilitation 2 or 3 years after the stroke occurred. Starting neurocognitive rehabilitation immediately will naturally provide us with more evident results, and can help us to avoid the onset of spasticity, or at least reduce its effects, but this does not mean that improvements cannot also be achieved after several years. In fact, our central nervous system is extremely adaptable, and does not have any set expiry dates. We have created a small video library in which we like to celebrate the accomplishments of our home rehabilitation patients, which we lovingly refer to as “the wall of heroes”. This library is full of people who have refused to give up after receiving a prognosis that their conditions could not improve any further. In fact, these videos do not yet contain any final results, since the work is still in progress, but at least they will give you an idea of the value of good rehabilitation. remember to also visit our facebook fan page. To find out more about our work and obtain useful advice, we recommend subscribing to our weekly newsletter, which provides over 5000 subscribers with useful tips for stroke care at home. The video guide will soon be online. Keep in touch with us by subscribing to the newsletter, which boasts an average of 37 new subscribers each day from all around the world. Our newsletter consists of a weekly email containing tips on stroke management and sample exercises. The first email will be titled: “10 Things You Need to Know About Stroke”. We recommend subscribing in order to be immediately notified once our video guide is released. One particular characteristic of this video guide dedicated to right hemiplegia and aphasia recovery lies in the fact that all of the physiotherapy exercises are explained in such a way that they can even be done with patients suffering from aphasia, with specially designed cards being used to facilitate communication with any patients who are still unable to communicate verbally. Since the therapy activities also require the creation of suitable conditions for communicating with your home patient, the guide video also contains simple speech therapy exercises designed to improve the patient’s comprehension, as well as to help them produce the first fundamental building blocks of language, like the words “yes” and “no”.